So, half a year after UMNO man Khairuddin Abu Hassan lodged a police report on 1MDB, his ex-DAP rival Mr Tan Tuan Tat today lodged one against tycoon Tong Kooi Ong and his influential business weekly The Edge over the use of documents related to 1MDB that might have been tampered with. The copy of Mr Tan's police report is attached and self-explanatory, I hope. Read my earlier posting Sarawak Report's reputation in tatters ... for context. You will be interested also to read a May 13 letter to FMT Was 1MDB set up by the Sarawak Report? by Calvin Sankaran. Thanks Mr Sankaran for leaving the comment earlier. I was rather curious at how Sarawak report could have got hold of so many pieces of confidential company documents and correspondence. However, the question remains as to the financial and economic damage which could result from 1MDB, irrespective of whether or not there is any malpractice or hanky panky on its part. I mean if you lose something, you lose it, irrespective of whether it was stolen, misplaced, accidentally thrown away or is lost due to a bad investment or business decision. b) Not all your readers are idiots. "This arrest has deflected the issue somewhat and for the Najib supporters, it seemed to have vindicated him. However, to those who understand and follow the issue closely, this arrest is a non-event. It does not explain the actual amount that 1MDB begged or borrowed or the amount that seemed to have poofed into thin air. The PM as the Finance Minister and Chairman of the advisory board of 1MDB should not need to wait for AG or PAC to explain exactly what is going on." And 100% right in saying that about 95% of the questions remain unanswered. The Sarawak Report is still standing by it's reports on 1MDB. It looks as if this matter has to be settled in the courts. Now who is going to sue the Sarawak Report and Claire Brown? In the Malaysian or UK courts? Did Tong & The Edge say "see you in court"? This should be fun, with more dirty linen to be laundered (oops, connotations of money laundering there....lol). With 1MDB, Mara, MIC etc there's hardly a dull moment in Malaysian politics. It makes you wonder if the country is running on autopilot. Foreign investors will no doubt be hankering for more predictable and safer places to invest in. Like Singapore, for instance? Today we saw the 2 clowns(Tunku Aziz & Salleh Keruak) immediately making statements and immediately ordered for investigation to the extent that wanted our police to also probe the arrest in Thailand. gila mahathir.. umur 90 jadi meroyan! "Now who is going to sue the Sarawak Report and Claire Brown? In the Malaysian or UK courts?" Can only happen in the UK courts. The fact that this hasn't happened for about 6 months so far is very, very revealing. The cover-up may have come too late to be convincing. If you claim to be Malaysian pls respect the National Language. If you want to be foreigner be so. Tampered emails ? Just proved that the emails do exist. How were they tampered ? Dare not show us the originals ? Dare not take SR to court ? I am hoping that the canary caged in Bangkok continues to sing and maybe give an exclusive to Tong and the Edge. 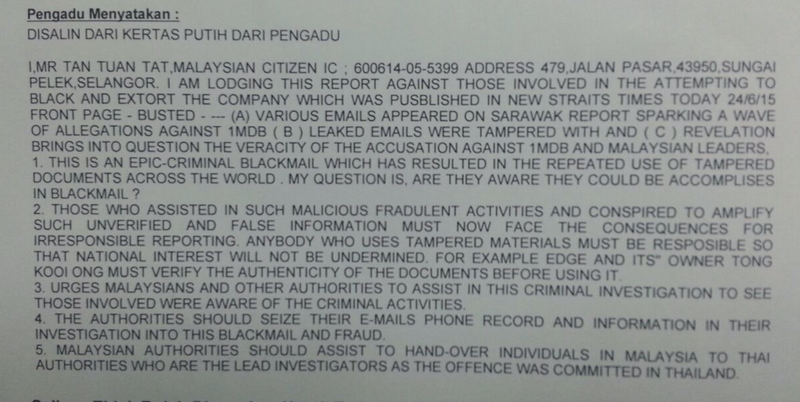 What if the police report was purposely done to crack 1MDB open for further scrutinize? what a poor command of English .. Does all these Thai arrest,tampered email, misrepresentation mean that there is no financial mismanagement on 1MDB's part and all monies are accounted for Rocky? Sue je Hang Pi Mana ? Tunggu apa lagi?!!! These are two different issues. The stealing of emails may be illegal. But the exposure of what was in the emails have exposed fraud, corruption and money laundering by Najib's 1MDB. Poor sod got jail but Malaysians are grateful to him. Nampak macam Najib yang akan terperangkap nanti. Keghairahan Zahid keluar kenyataan pasal ekstradisi ke Thailand serta "kejayaan" melondehkan kegiatan pemalsuan dokumnen pasti akan memakan diri. Yang kita dengar cuma dari mulut Zahid dan akhbar Thai. Tak pelik ke.Thailand yang tangkap, kalau betul fitnah ke atas Petro Saudi dan polis Thailand bertindak atas permintaan siapa? Polis Saudi atau Switzerland. Tak mungkin Malaysia sebab mangsa fitnah Petro Saudi. Zahid kata Thai mungkin mohon ekstradisi personaliti Malaysia, tapi Thailand kata nak ekstradisi mamat Justo ni ke Switzerland. Satu pertanyaan kes ni siapa punya dan siapa yang meminta Thailand tangkap dan siasat. Saudi, Switzerland atau Malaysia. Kalau betul Justo ni salah, kat mana kes akan di dakwa. Anehnya ianya serentak dengan kes di Australia hingga Najib terpaksa defend Annur Muss. Ex Dap Man MEANS Future Datuk Man. Sure to naik pangkat after this Police Report just like that Huan Fella.